Recently, Cliven Bundy, an American rancher, pontificated these views after seeing a public housing project in Nevada. The comment that Blacks would have been better off as slaves picking cotton stuck with me because, it was just few months back that I had read a similar comment made by James Henry Hammond who a politician and planter from South Carolina who served as a United States Representative, the Governor of South Carolina and as a United States Senator in the mid-19th century. In Letter to an English Abolitionist written in 1845, he argued that slavery was more humane than wage labor. Quoting slave writings from Solomon Northrup, Harriet Jacobs, and Charles Ball, I had written essay refuting Hammond’s alternate universe. The very casual way in which Bundy suggests slavery as a alternative, even after all these, is quite shocking. Over the past few months, I also wrote few other essays on American slavery, like From a Society with Slaves to a Slave Society, Understanding Thomas Jefferson, and Disputing the Jefferson Davis Theory. 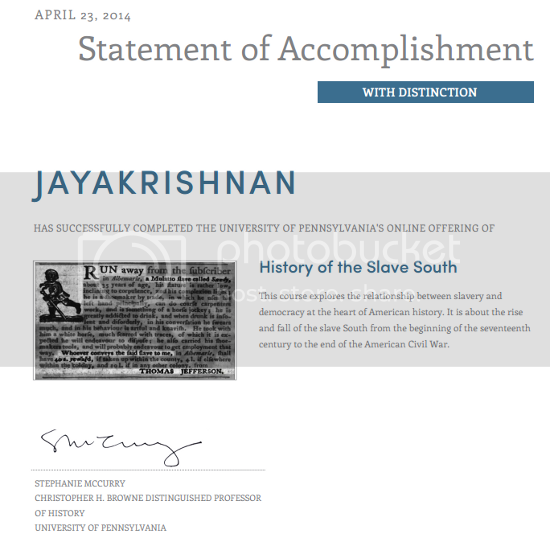 All these were part of the coursework required for the Coursera course from University of Pennsylvania titled, The History of the Slave South. For completing these essays and participating in the weekly discussions, I got a certificate as well. Congratulations on your completion of the course! Since the certificate doesn’t have the “name not verified” disclaimer, did you perhaps take the paid “signature track” on this? Sundar, No, I did not take the paid signature track. I was not sure if I would be that committed, but this course was really interesting and the assignments were reasonable.